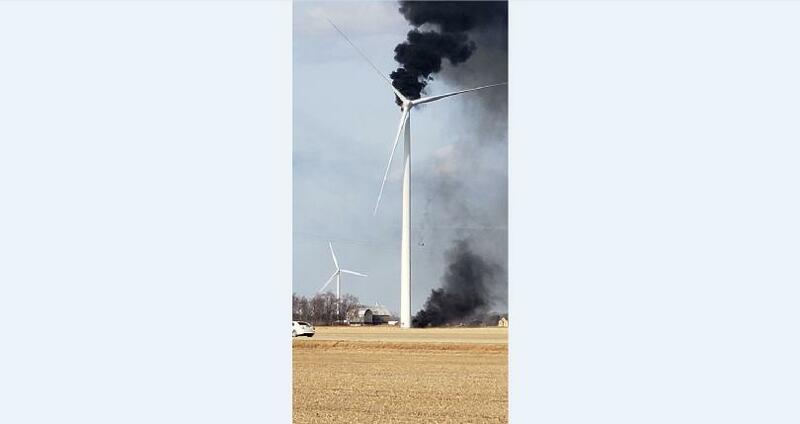 A wind turbine in Huron County caught fire and dropped flaming debris to the ground Monday afternoon. The fire was reported around 5:30 p.m. on Elkton Road near Berne Road in Oliver Township. The wind turbine involved is located about a half mile off the road, so a witness said fire crews are having trouble accessing it. The Oliver Township Fire Department also doesn’t have an aerial truck, so firefighters can’t reach the flames with hoses on the ground. A witness said traffic is backing up in the area from onlookers. Firefighters could not immediately be reached for comment on what may have sparked the fire.